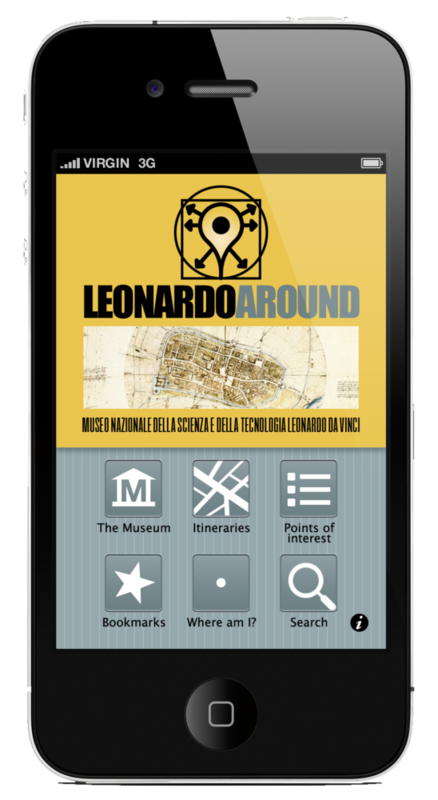 On march 21st we launched a new mobile app (iPhone & iPad by now) in cooperation with Milan’s Museo della Scienza e della Tecnologia “Leonardo Da Vinci”. The app, developed in collaboration with our french business partner Latitute-Sedona and funded by Fondazione IBM has a pretty nice story. I went to do a speech almost a year ago at Università Cattolica del Sacro Cuore (yes the same university where i got my degree…life cycles) on the Smarter Planet. I was invited by professor Anita Longo who, at the end of the event, brought me to have a lunch with a close friend of her. The close friend was Paolo Cavallotti, the Museo della Scienza e Tecnologia CIO & tech-gizmo. The lunch was so nice we decided to do something togheter: so between a panino and a coke I wondered why Milan did not have any dedicated “city tour” through the Leonardo Da Vinci’s works inside the city. I’m sure you know that Leonardo was born in Vinci, but he reached his acme while in Milan funded by Ludovico il Moro and the Sforza family. So Milan is a perfect stage to learn more “on the field” about Leonardo. And which better occasion than to have the Musuem to support this idea being the Museum itself the “official” place in the world where the Leonardo genius is told (most of the musuem is dedicated to his life, work, history). With Paolo we phisically drawn the app concept on a paper table cloth and then I add the name: “why don’t we call it LeonardoAround”? “Another app you could say”. Well it is and it is not. It is because it leverages the classic functionalities that a digital guide has: locate me, show the closest place of interests, tell me (on google maps) how to reach the destination, provide rich media contents, allow to browse between arguments or themes and so on. Nothin really new. What is new is the scenario and the concept. The scenario refers to our capability to put together the political landscape, the cultural enviroment and finally join some contents that have never been glued in one single physical space. The concept is what I call the “air museum” or the musuem without the walls. Infact, the app enable a new way to browse the museum in an endless ping-pong game where the user can switch live bewteen contents inside the musuem and the point of interest located all over the city. This, summed with some ad-hoc super contents created by Claudio Giorgione – one of the most relevant Leonardo’s experts – and some orginal drawings from the most important Milan’s Museums, build a new way to conceive the museum unbounded from its own building and as a live part of the city. It also give a new breath to the city touristic offering. During the press conference we had a lot of questions regarding next steps. I see a lot of potentiality. First of all extend and implement the app (android for sure, plus the accessible version should be already downloadable while i am writing). Second a content extention to more point of interest in and outside milan. Third, bring this logic wherever there is a strong relation between and artist or an “hero” and a city: think for example Cristopher Columbus and Genova or Gaudì and Barcelona. This is a wonderful game to play, and (maybe) this is only the beginning.